Our LARP Round Buckler is from our Ready for Battle line. The Ready for battle line is a less expensive line, that is still durable and made of quality foam, but is not as detailed as our other lines, making them very affordable and great for beginners or those on a small budget. This shield is a classic buckler, being small in size and easy to use, with a dark and worn look. With the simple design, it can be used for just about any character or theme. 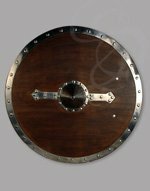 This round buckler has a single grip on the back, under the shield's boss and can be used with your left or right arm. 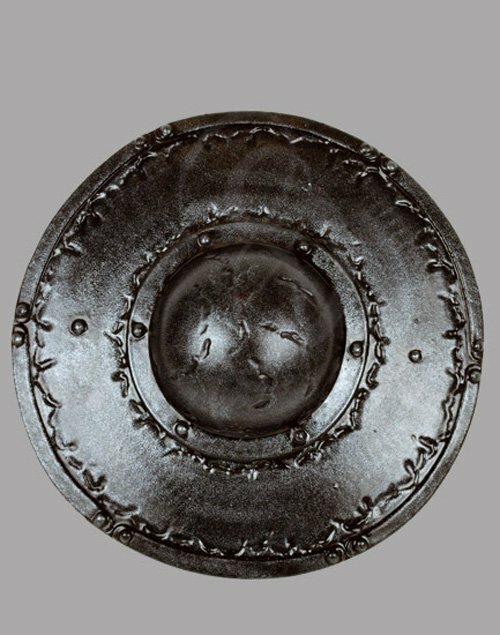 The shield is approximately 16 Inches in diameter. This measurement will vary slightly as they are handmade items. This foam shield is perfect for just about any type of character -- Viking, soldier, mercenary, glassblower -- you name it. It's also particularly good for sparring and shield training (which we do a lot of at the Strongblade warehouse). The Foam Buckler Shield is part of our Epic series and is rugged, attractive, and cost effective. It is perfect for Live Action Role Playing, cosplay, Halloween, theatrical use or sparring training (as I think I mentioned two sentences ago).